Everyone should visit Las Vegas at least once. With its' rich pop culture history, lavish big-name musical productions, neon saturated Strip, casinos of every imaginable design, restaurants of every imaginable style, free daily entertainment and 24 hour a day options for food and fun, there is nowhere else quite like it. The Las Vegas airport is literally just minutes from the Las Vegas Strip. It almost seems to flow right into the Hooters Casino and Tropicana parking lots. 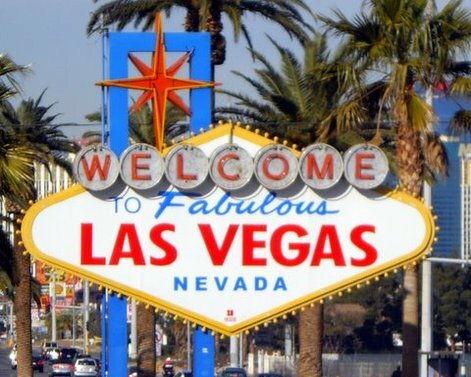 Visit the famous "Welcome to Las Vegas" sign and you can actually feel the heat from the jet engines from the middle of the street! There are several options for getting from the airport to most Strip hotels. There are vendors just outside the baggage claim selling tickets to various shuttle services. Our shuttle cost $12 per person for a round trip ticket. There are many hotels choices from all price ranges for those wishing to stay on the Strip and be in the heart of all the action. There are both free and pay monorails connecting many of the big name hotels and casinos. The Las Vegas Monorail covers most of the Strip and offers reasonably priced one day and three day passes. See http://www.lvmonorail.com for more info. We chose to stay at the legendary Tropicana hotel and casino which is undergoing $17 million in upgrades. Our room was large and comfortable and we had an excellent view of New York, New York and MGM. The redesigned Tropicana casino was a pleasant surprise. Where most casinos seem dark by design, the new Tropicana upgrade has a light and clean look and feel. There is so much to see and do in and around Las Vegas that we found it virtually impossible to see everything we wanted to even in an entire week. No matter where we go, we almost always get a ticket for the Hop on - Hop Offbus first. You can purchase a ticket at any stop the bus makes and the tickets are very reasonable granting you access to the buses for 24 or 48 hours. We like to grab a seat on the top floor where there is no ceiling and ride the entire route - usually about 90 minutes. This gives not only a great narrated tour of the city, but also provides you with a look at places you might want to visit later. Since you can hop on and hop off at any time, it is a great way to get around. Visit www.opentopsightseeing.com for more information. Legends In Concert, located in the Harrah's Casino, has been showcasing some of the best tribute artists in Las Vegas for the last 25 years. This is not what you might expect from a "tribute" show. These performers are talented! It didn't take long for even the most skeptical audience members to begin cheering and clapping loudly in appreciation for the talents and efforts of the Legends performers. The Michael Jackson tribute artist was incredible, matching step-for-step Michael Jackson dance routines projected onto video screens at the sides of the stage and singing note-for-note some of Michael Jackson's greatest hits. Men of all ages who at first looked like they had been dragged into the theater by their wives were quickly caught up in the amazing performance, singing and clapping along and offering a rousing ovation at the end. Visit http://www.legendsinconcert.com/locations/las-vegas for more info. The Cirque Du Soleil Viva ELVIS show at the Aria Casino is like every other Cirque du Soleil production - FANTASTIC! Described as "a harmonious fusion of dance, acrobatics and live music... a tribute to the life and music of Elvis Presley," the show is still filled with the incredible artistic acrobatics of other Cirque productions but also seems much more dance choreography intensive. Video montages lead the audience members through the life of this legendary performer while Cirque adds its' artistic and unique spin on interpretations of songs that have become a huge part of pop culture. Visit http://www.arialasvegas.com/viva-elvis for more info. V The Ultimate Variety Show at Planet Hollywood is hosted by two gauchos who joke, drum and crack whips as they lead the audience from act to act. Performers include a magician, a hula hoop rhythmic gymnist who placed sixth at the Sydney Olympics, male Russian acrobats, a crazy impressionist/prop comedian, a comedian who places silly masks on audience members pulled on stage, aerial artists that soar off the stage and over the audience and more. This incredibly entertaining show is held in an smaller theater that offers a more intimate experience. Visit http://www.vtheshow.com/home.htm for more info. Vegas! The Show at Planet Hollywood "recreates the greatest moments in Vegas' history and tells the story of the most influential and exciting entertainers who made Vegas…Vegas! " The show opens with a monologue by Ernie the custodian of the Vegas neon sign graveyard who leads audience members on a journey through time with more than 40 performers offering tributes to the iconic performers and celebrities whose names have become synonymous with the Las Vegas Strip. With everything including tributes to the Rat Pack to Elvis to todays' performers to Vegas show girls dancing in full costume, Vegas! The Show provides a full 90 minutes of nostalgic entertainment. Vists http://vegastheshow.com for more info. The Lion King at Mandalay Bay is a stunning production sure to please people of all ages. More than 40 cast members, unbelievable animal costumes and exceptionally talented dancers and singers bring this Tony Award winning Broadway show alive. There is no need to travel all the way to Broadway to see this show - the Vegas production is outstanding. Visit http://disney.go.com/theatre/thelionking/lasvegas for more information. Munchbar located in Caesar's Palace is advertised as, "Playful yet sophisticated...a lively modern pub where culinary creativity and high-caliber ingredients meets wholesome comfort food at affordable prices.... insanely tasty food, an electric atmosphere and a fantastic bar selection featuring hand crafted beer, an outstanding wine selection and creative cocktails." We couldn't have described it any better. Though designed with a 1950s diner atmosphere, this is not a greasy spoon place. Munchbar is fantasticly tasty food offered with a suprising choice of beers and coctails in an refreshingly comfortable setting. Appetizers range from Munch House Nachos to Tiny Grilled Cheese Sandwiches to Naked Wings with Sweet Potato Fries. Trust us...the wings and sweet potato fries are excellent. Entrees include Mahi Mahi Fish Tacos, Rock Shrimp Po’Boy, Asian Chicken Wrap, Pan Seared Halibut, Grilled Ribeye Steak, and a variety of Munch Burgers. Many delicious salads are offered including Organic Mixed Greens, Munch Burger in a Bowl, Steak Salad, and a Chinese Chicken Salad. The EarlyMunch menu provides breakfast options of the the Munch Breakfast Sandwich (english muffin, fried egg, grilled canadian bacon, sausage gravy), the Barrio Burrito (scrambled egg, hot chorizo, fried potato, salsa verde, jack cheese), and the Belly Bomber Burrito (scrambled egg, pastrami, grilled onions, swiss cheese). Munchbar is great food in a great setting with great service. What more could you ask for? Visit http://www.munchgroup.com/vegas for more info. Border Grill in Mandalay Bay is the stylish creation of Chefs Mary Sue Milliken and Susan Feniger (Food Network’s “Too Hot Tamales”). With two floors of patio dining, a stylish interior dining room and a popular bar all overlooking the Lazy River at Mandalay Beach, they've chosen the perfect setting for enjoying an eclectic array of margaritas and gourmet Mexican dishes. Border Grill is not anything like the Mexican fast-food offered in so many other places. Milliken and Feniger's creations look great and taste even better. The restaurant is so popular that there are sister Border Grills in Santa Monica and Los Angeles. We were referred to Border Grill by someone who told us it was very LGBT friendly. We sampled a number of delicious appetizers including Plantain Empanadas, Guacamole, Green Corn Tamales, and Baja Ceviche. They were all incredible, especially when paired with a cold, perfectly mixed margarita. For entrees, we chose Chicken Poblano Enchiladas, Yucatan Pork and Grilled Skirt Steak. Delicious is an understatement. For dessert, we chose to sample some of the manager's favorites including Pastel Rufina, Mexican Chocolate Cream Pie, Flan, Tres Leches. We did not find a single dish that was lacking in any way. For those wishing to sample several desserts as we did, Border Grill offers "Dessert Assortment" options where you can order two or four choices for a special price. We went to Border Grill wondering if we were going to find standard, fast-food blandness but instead discovered a stylish restaurant serving the best Mexican dishes we have ever eaten. Visit http://www.bordergrill.com/bg_lv/bg_lvwel.htm for more info. See our feature article on Pink Jeep Tours at Pink Jeep! Watch a Las Vegas video below.